Raw, unpasteurised and packed with the good stuff. Made as nature intended, Rayner’s Organic Apple Cider Vinegar is raw, unfiltered, unpasteurised and contains “The Mother”. Shake up the bottle to release the unprocessed goodness of “The Mother” which is packed full of live bacteria and active enzymes. Rayner’s Organic Apple Cider Vinegar has a delicate aroma and distinctive apple flavour which is ideal for dressings, sauces and marinades. Used for centuries as a natural tonic, mix a tablespoonful in a glass of water with honey for a refreshing drink to start the day. 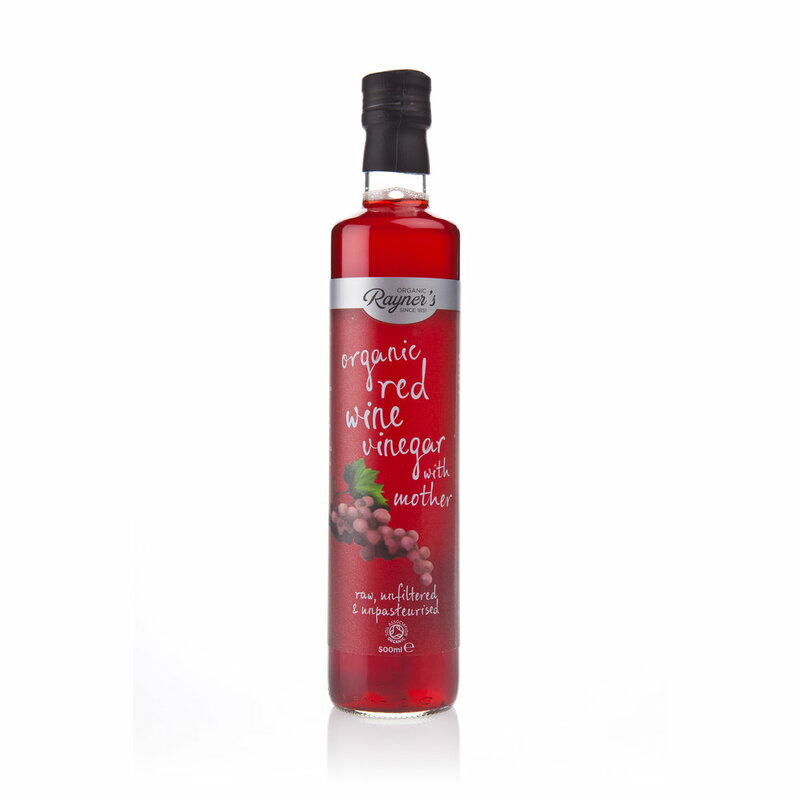 Rayner’s Organic Red Wine Vinegar is the UK’s first red wine vinegar with “The Mother”. Made as nature intended, “The Mother” is the raw, unfiltered and unpasteurised goodness that other vinegars leave out. Rayner’s Organic Red Wine Vinegar is chock full of live bacteria and natural enzymes. Dissolve a tablespoonful in a glass of water with honey as a refreshing drink packed with nutrients. With a delicate aroma and characteristic red wine flavour - it is perfect for dressings, sauces and marinades. The UK’s first white wine vinegar with “The Mother”, Rayner’s Organic White Wine Vinegar is raw, unfiltered and unpasteurised. It contains “The Mother” – all the nutrient rich stuff that other vinegars filter away. Shake up to release these live bacteria and natural enzymes. Rayner’s Organic White Wine Wine Vinegar is ideal when making dressings, sauces and marinades. Often used as tonic – just add a tablespoonful to a glass of water with honey to start the day with a refreshing drink. 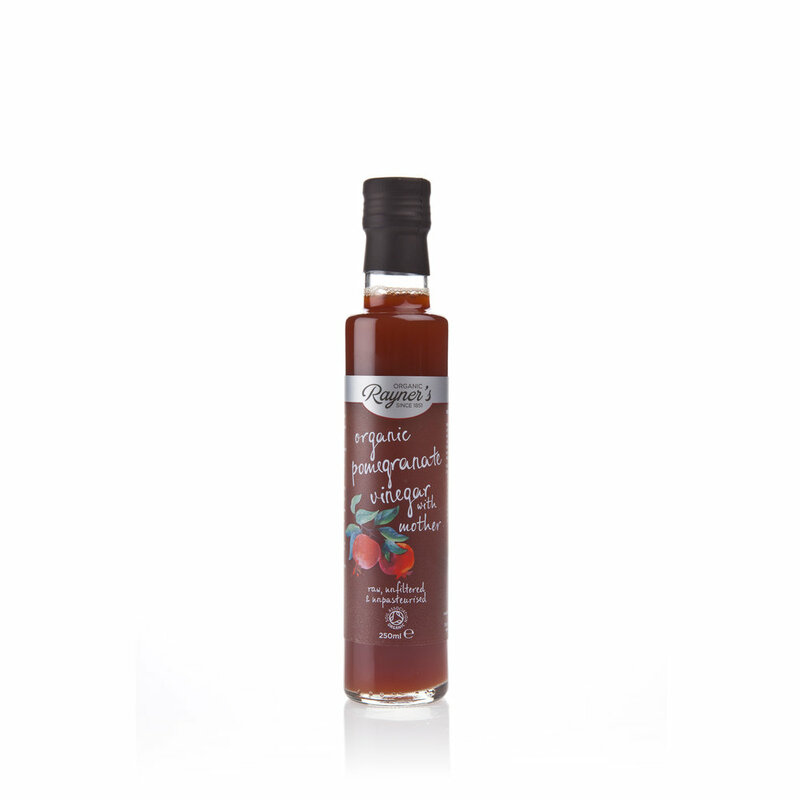 Rayner’s Organic Pomegranate Vinegar is raw, unfiltered, unpasteurised and contains “The Mother”. Give it a shake to unlock the live bacteria and natural enzymes. Rich in antioxidants, it includes a dash of organic pomegranate juice to enhance that delicious pomegranate flavour. With its delicate aroma and distinctive taste, Rayner’s Organic Pomegranate Vinegar works perfectly as a salad dressing, along with marinades and sauces. To make a refreshing tonic add a tablespoon to a glass of water with honey and enjoy. 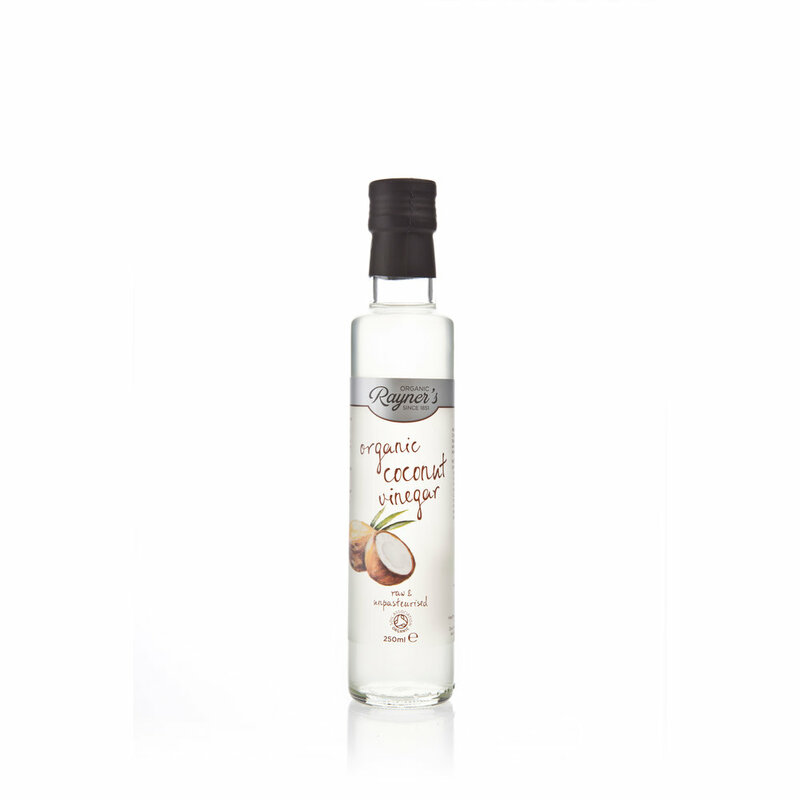 Rayner’s Organic Coconut Vinegar is raw and unpasteurised which keeps nutrients locked in. No calorie and fat-free, Organic Coconut Vinegar has the same benefits as apple cider vinegar - it alkalises food once in the body - but with a gentle taste and scent profile. With a light aroma and distinctive nutty flavour, it so can be used in dressings, sauces and marinades. Stir a tablespoonful into a glass of water with honey to create a mouth-watering drink to start your day on the front foot. A low-sodium alternative to soya sauce, Rayner’s Organic Coconut Aminos contains organic coconut flower blossom nectar and pure sun-dried sea salt and that’s it. Made as nature intended, this simple process creates a uniquely different sauce that includes 17 naturally-occurring amino acids, Vitamins B and C and potassium. 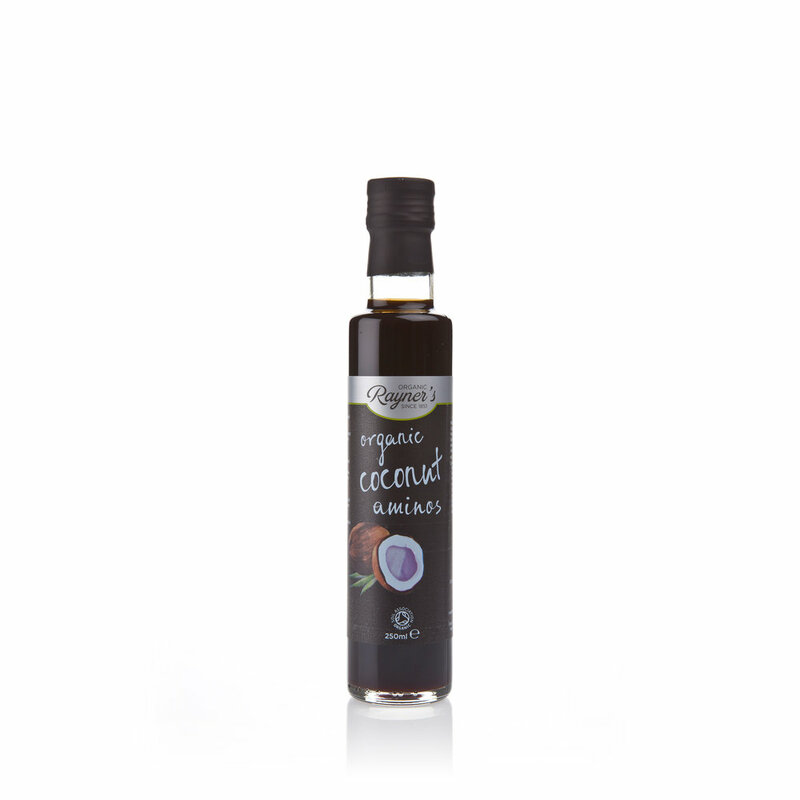 Organic Coconut Aminos is a versatile store cupboard essential that can be used in stir-frys, salad dressings or marinades. 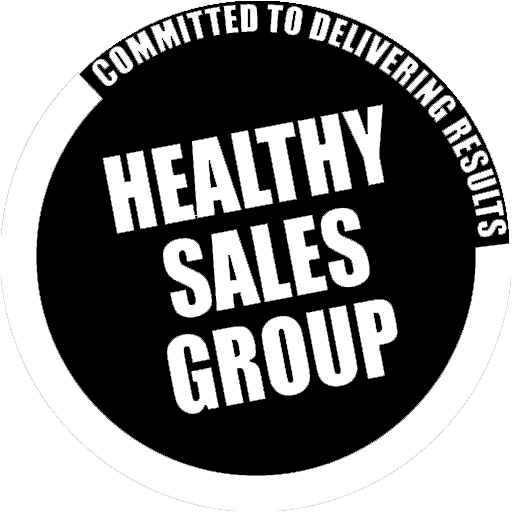 It also tastes great as a seasoning for vegetables, meats, fish, soups and sushi. Naturally fermented. 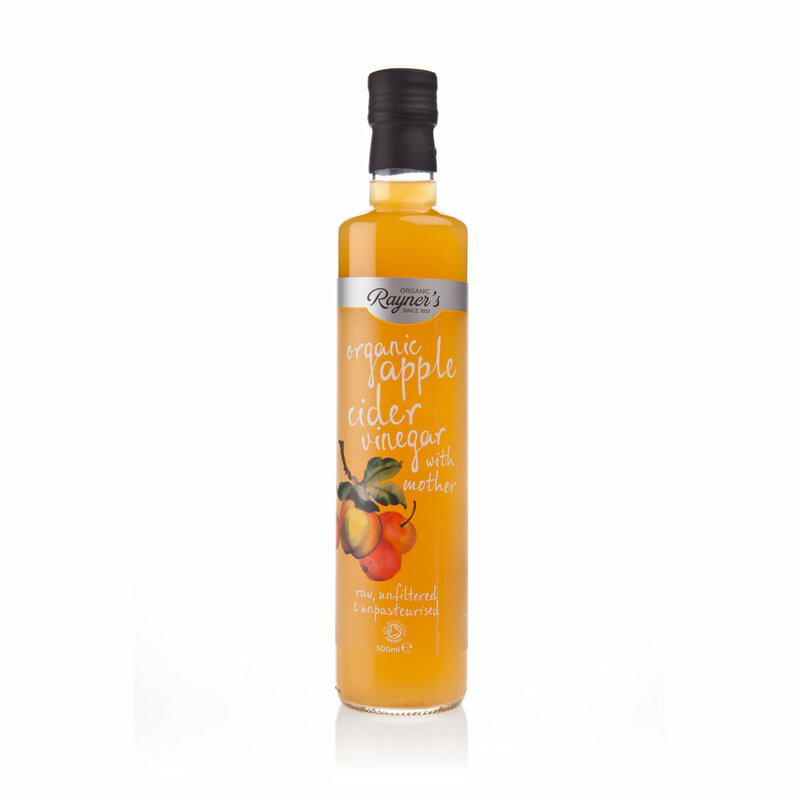 Rayner's Cider Vinegar is made from whole dessert and cooking apples.